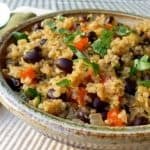 Looking for a tasty alternative to black beans and rice? How about Black Beans and Quinoa? 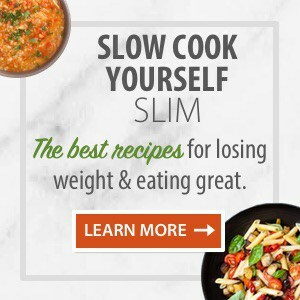 It’s an easy, healthy and delicious, protein-rich dish that works equally well as a side or main dish. Serve it plain, or to fancy it up. 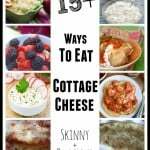 “Top it with fresh tomato salsa and crumbled queso fresco or feta cheese,” as suggested in the recipe’s headnotes. 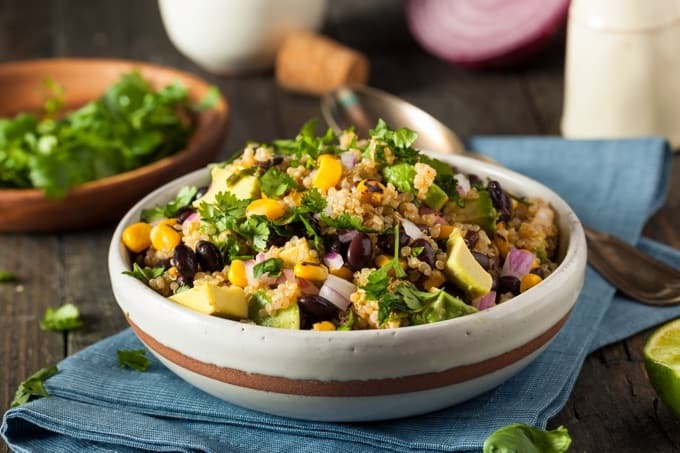 This recipe for black beans and quinoa is another winner from one of my favorite cookbooks, 5 Easy Steps to Healthy Cooking: 500 Recipes for Lifelong Wellness by Camilla Saulsbury, which I’ve mentioned here several times. My sister recently picked up a copy. When I talked to her today, she mentioned that she has dozens of post-it-notes marking recipes she’s planning to try. Is there a better cookbook endorsement? 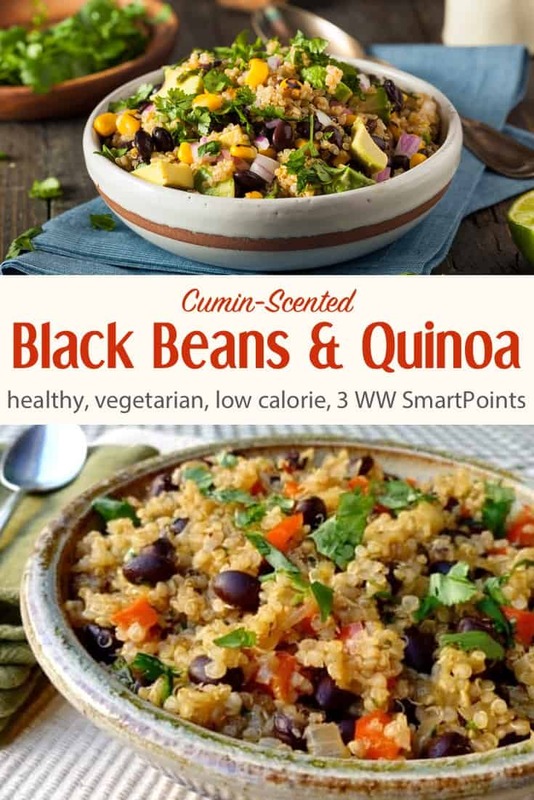 Light yet filling, this tasty cumin-scented black beans and quinoa is the kind of dish I love to eat for lunch. Recently, I enjoyed it for lunch with half of a chopped up cooked turkey burger and some pico de gallo on top. It’s also yummy on a bed of greens with a little salsa and cheese. 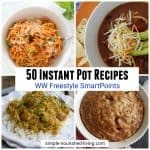 According to my calculations each serving has 154 calories, *4 Weight Watchers PointsPlus, *3 WW Freestyle SmartPoints. I think this works for WW Simply Filling too, provided you don’t exceed your daily good health guidelines for healthy oils. 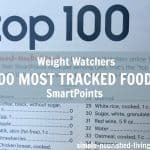 Be sure to adjust your Points accordingly with any added toppings! Corn, tomatoes, cucumber, shredded carrots, edamame, etc. Pineapple, mango, mandarin oranges, etc. 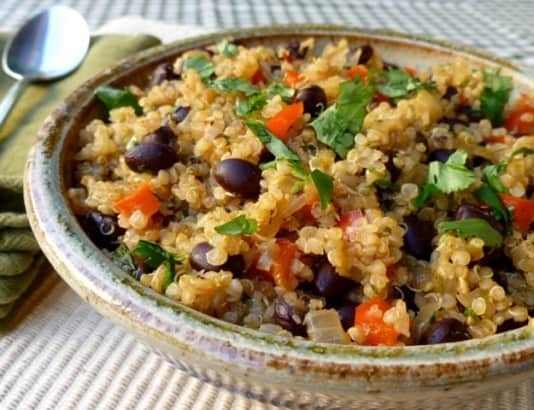 If you’ve made this quinoa with black beans, please give the recipe a star rating below and leave a comment letting me know how you liked it. 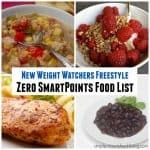 A satisfying, easy, healthy and delicious side dish or vegetarian main dish with only 3 Weight Watchers Freestyle SmartPoints. In a medium saucepan, heat the oil over medium heat. Add the red pepper and onions and cook, stirring often, until slightly softened about 5 minutes. Stir in the quinoa, cumin, chile powder, salt and water. Bring to a boil. Reduce heat to medium-low and cover. Simmer until quinoa is barely tender, about 15 minutes. Stir in the beans and half the cilantro and simmer, uncovered, until the liquid is absorbed, about 3 minutes. How much dry quinoa?! 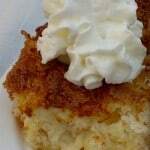 I’m making this tonight but that’s not included in the recipe! Please email me! 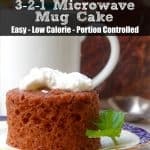 Hi Allyson, I just checked the recipe and it’s there: 3/4 cup! This looks great! Thanks for the recipe.